It is said the one doing the talking is the one doing the learning. So why should the teacher be the only one providing all the feedback in the classroom? 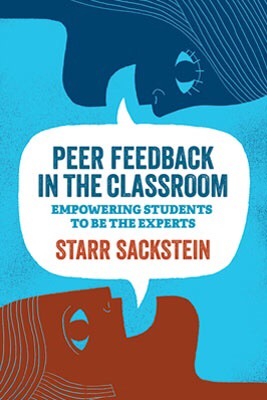 Starr Sackstein’s new book Peer Feedback in the Classroom helps teachers teach students to become experts at providing peer-to-peer feedback. Starr is the author of Hacking Assessment and teaches journalism and English in New York. She has developed a system where students review one another’s writing, challenging one another to write more effectively. She is adamant about student agency and her practical descriptions show how she facilitates this agency in her classroom. Although she writes from the perspective of a journalism teacher, her strategies can be easily implemented in other subject areas. As an English teacher and high school golf coach, I see how I can apply her work to both my classroom and my team. Her suggestions are not just applicable to writing, but to any content area where the teacher wants to empower students to take control of their learning and support one another’s growth. Teachers can easily adapt peer feedback to their own setting. The backbone of Starr’s system lies in the creation of experts roles. Each student is enabled to be an expert on a specific aspect such as textual support, transitions, or coherence. Any aspect of student work can be turned into an expert role. Starr describes how to arrange the class, establish roles, prepare students to take on those roles, and handle any challenges that may arise. After reading her book, I am excited to see how empowering experts will transform my class, allowing learners to support themselves and one another. I have been brought out of my comfort zone multiple times and forced to take on roles unfamiliar to me… However, this challenge is what caused my writing to evolve. I have noticed that I now take on many aspects of a text and qualify my arguments instead of being cemented in one mode of thought. After reading this book, I feel I can help my students become interdependent writers who can draw on the insight of their peers and encourage one another’s growth. Peer Feedback in the Classroom can help students take more responsibility for their work, allowing the teacher to facilitate student-centered learning that is relational and empowering. This is a book I will keep on my desk and refer to throughout the year.